These lines went out from my mouth suddenly. 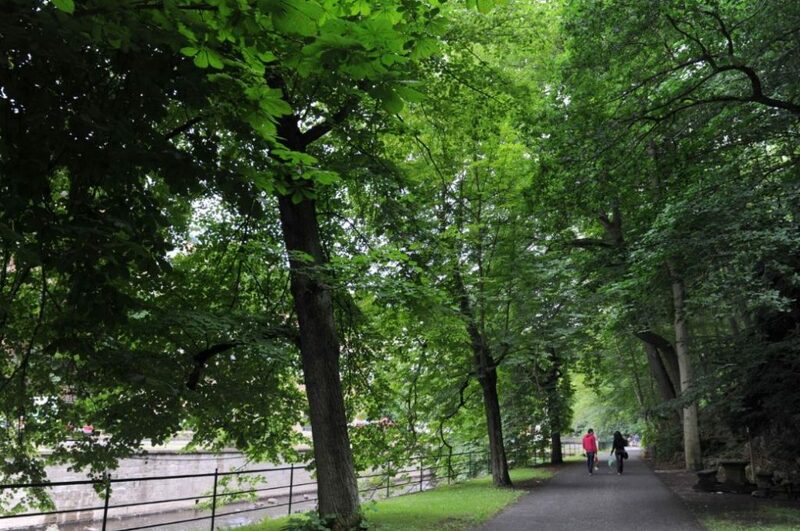 In the eraly morning we arrived Karblovy Vary’s green forests. It’s a relax, soul warming place. Like Elfs’ hidden cities in Tolkien’s Middle Earth, suddenly it appears among mountains. Vapors of hot baths adds a foggy layer to this frame. It’s like a ornate bride. The city is so peaceful and calmed, you can even hear the sounds of hot water stream that goes through city. This name means “King’s Bath” in Chech, and city is located in the west side of Chech Republic. After two hours drive from Prag city stands Warm River’s valley. It’s established in 1300’s from Roman Emperor Karl VI in West Bohemia region as a thermal spring village and it’s old name is Karlsbad, means Karl’s Bath. From that time to today a lot of famous name from the world of politics, military or arts visited here. Karl Marx, Sigmund Freud, Beethoven, Mozart… For a time, Atatürk was hospitalised in here. The days that he spend here can be read in his diaries as “Karlsbad Diari Part” and contains 30th of June – 27th of July 1918. He stayed in Carlsbad Plaza which is a still active resots and after that he wanted to open thermal springs in Yalova. Hotel respected his memory and placed an honor for him. I think about if these springs took care his pains. Inside of the city is energetic, shops are shining, streets are crowded and everywhere is so clean. I left the group and looked for a place to have a cup of hot drinnk. On a stream that goest through Karlovy Vary there is a bridge and on that bridge there are tables and chairs. A smiling waiter serves to these tables and we realise how this bridge-cafe idea is lovely. Havin coffee is a joyful thing and if the place is beautiful that makes the moment unforgettible. Like a photograph. There are gift shops everywhere. Traditional glass works, crystal, porclain, jewelerry, cotton candy and special drinks are attracting attention. A liquor named Becherovka with a lot of essence and spices with cinnamon aroma is considered special drink of this place. Thay say after you drank salyed spring water you need Becherovka. Becherovka and spring water ease pains. Salesmen are smiling and really experts. When the salesman hears we came from Turkey he took out A Turkish flag and put it on his shoulder. A admired his marketing skills because after us a group from Switzerland came and he took out a Swiss flag! While we were walking we see Aslan Asker Şvakk’s full size muppet. The muppet invites us to a restaurant named U Svejka. Chech writer YaroslavHaşek’s novel character that teases with militarism, governance, wish of war Şvayk takes great attention fot the ones who want to take photographs. There are a lot of hotels for using hot baths and stay. There is a fancy area in the middle ot the city, where the hot water springs. You can see the warmth and power of water. In a glass construction named Vridelni Kolonada we see hot water jumps meters up with it’s own power. These drinkable water is hot, salted and if you don’t see that as a medicine it’s impossible to drink. Vapor spreads from the spring in the middle of the city and these 40 degrees water creates an amazing atmosphere like a fairy tale. Today people come here to relax, regnerate. 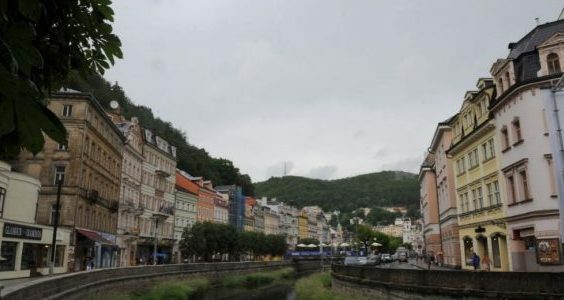 Karlovy Vary is not about thermal tourism only an international film festival held in here since 1946, every year. Every year on July these for these festival a lot of celebrity come here and that makes city’s cultural life colorful. Night life is colorful even it’s a small city. Night clubs, bars, restaurants and cafes offers joyful times. There are some special shows and entertaining programs in some restaurants. City museums, galleries, statues and great architecture makes it seen like a little Prag. There is a funicular on the top of a hill that stands in the forests that surround the city. If you don’t waste your energy while walking to the hills you can arrive there in a minute. Panoramic wiev of city was in front of us. This reminded me plateaus of Blacksea I don’t know if it’s from clean mountain air or greenery. I tought is it to hard to develope somewhere without ruining it. On the bus ride while we were coming back, i touched the glass necklace that I bought and warmed it inside my hand. Karlovy Vary enlighted my soul. Calmed, peaceful, silent and green Karlovy Vary. Goodbye Karlovy Vary! 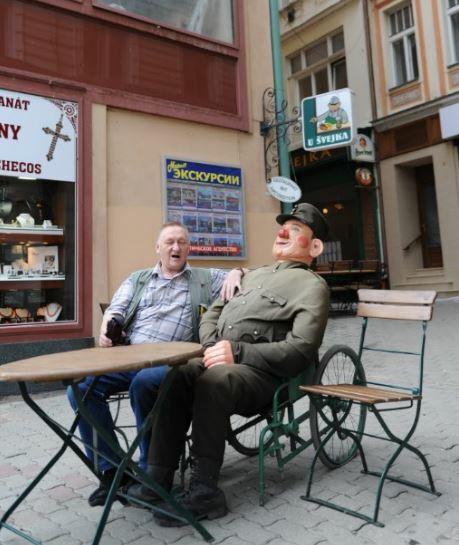 NaŞledanu Karlovy Vary!